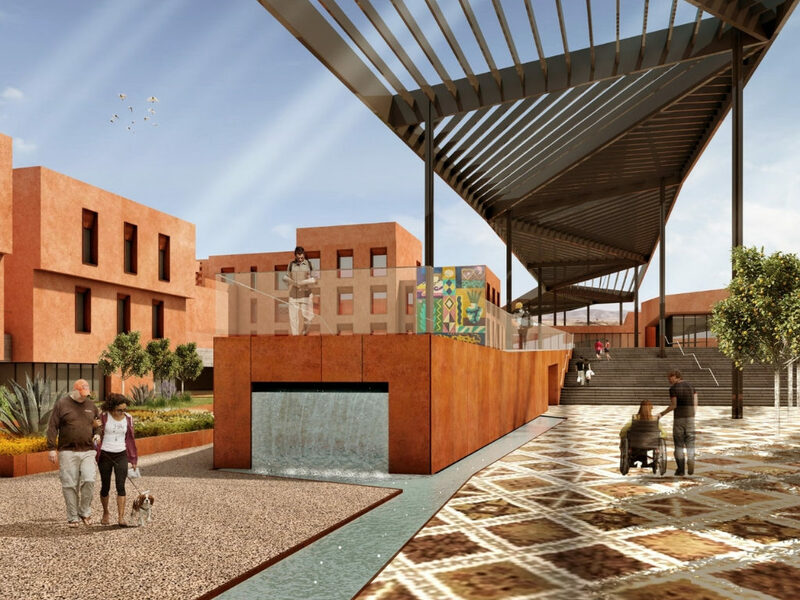 Morocco’s Ministry of Interior held an open design competition in 2018 for the Marrakesh Cite des Arts. 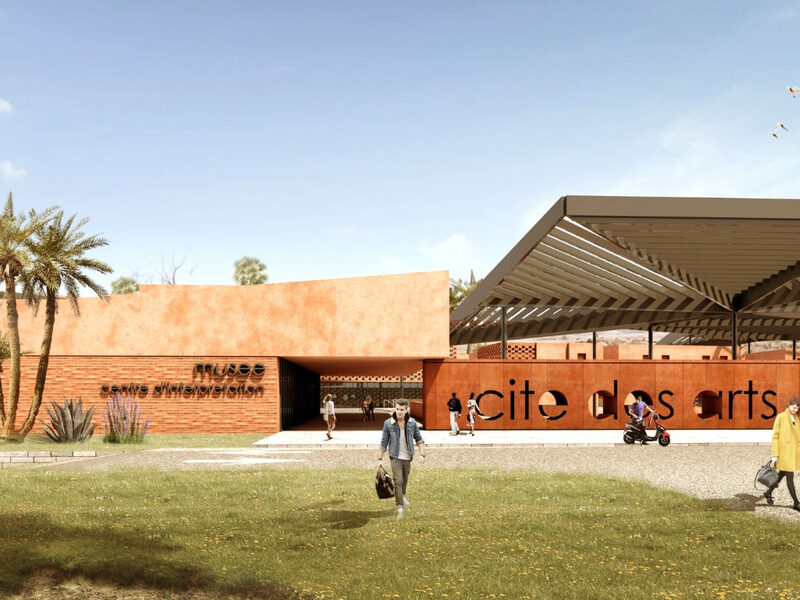 This “City of Arts” will be a 160,000-square-foot (15,000 m2) mixed-use cultural complex built on a 14-acre (5.5 hectare) site. 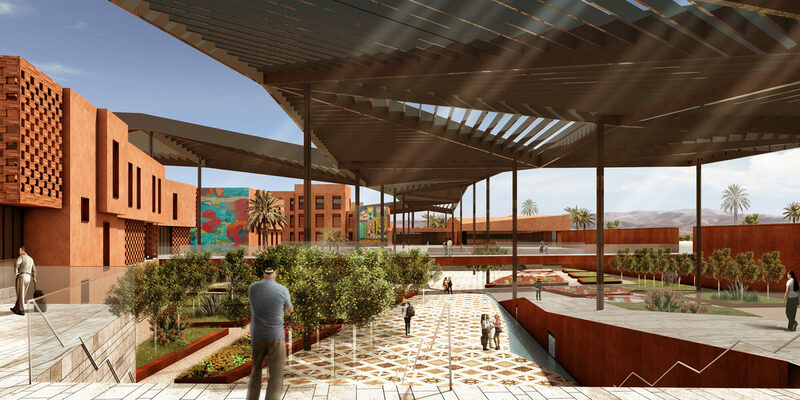 In an effort to strengthen the country’s cultural and artistic identity, the goal of the Ministry was to commission a new physical environment to highlight the relevance of traditional art in the realities of contemporary life. 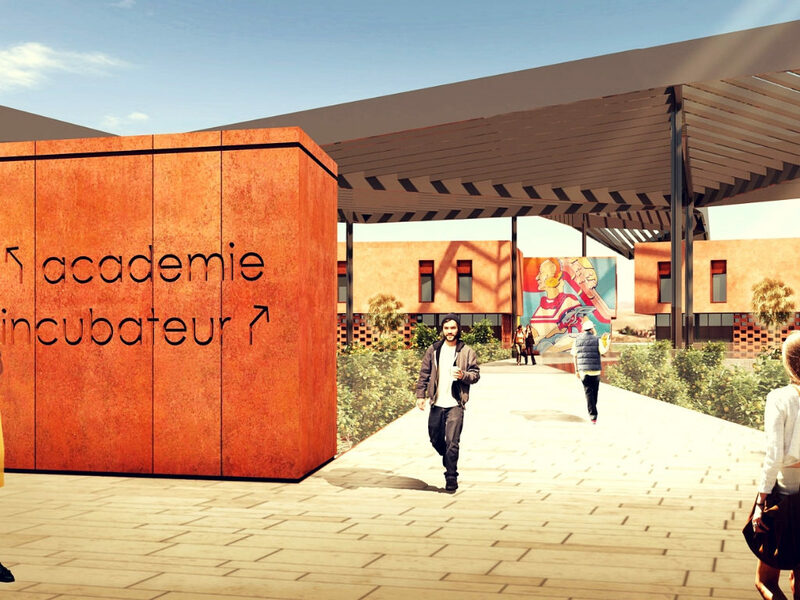 The program for the campus includes an art museum, multi-purpose theater, academy for arts and theater, and incubator studios. 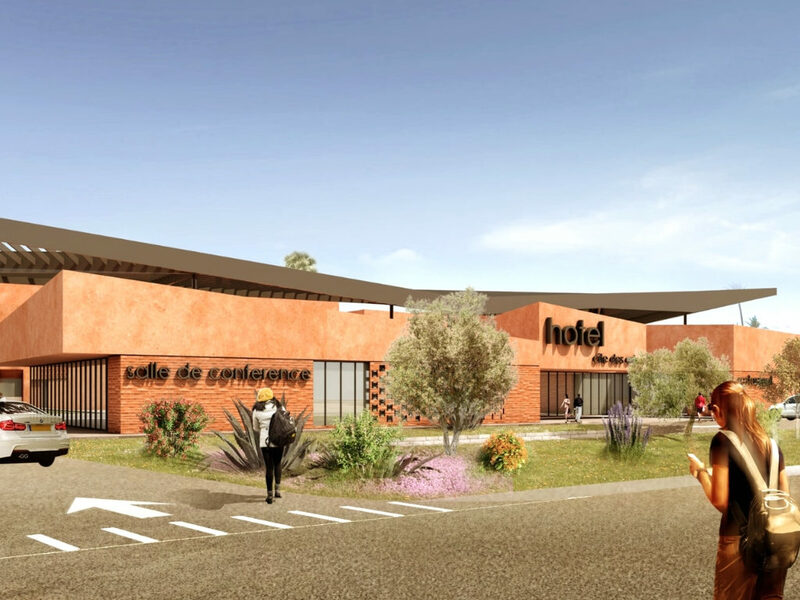 Visitor amenities include a hotel, restaurant, conference hall and underground garage parking. 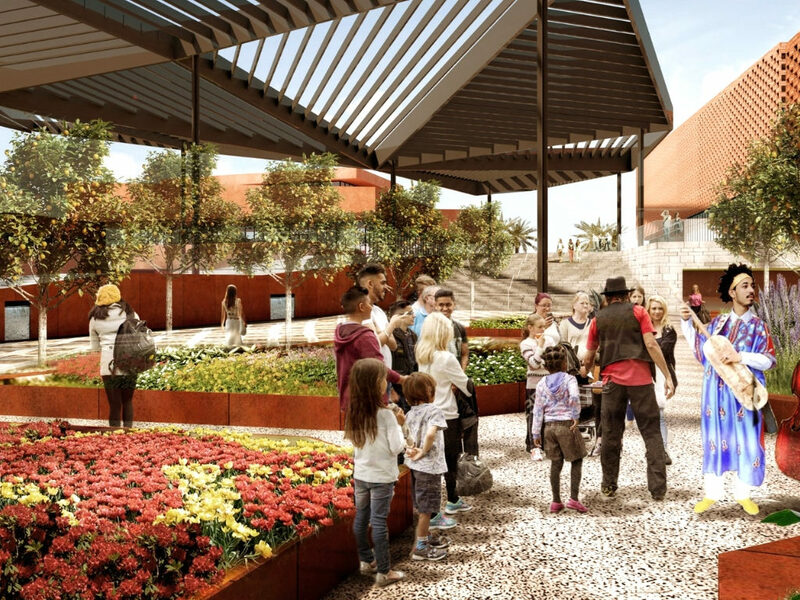 The master plan also called for an outdoor sculpture garden and amphitheater. The A359 team began the effort with the desire to provide visitors and artists with a place that would encourage gathering, understanding, and social growth. 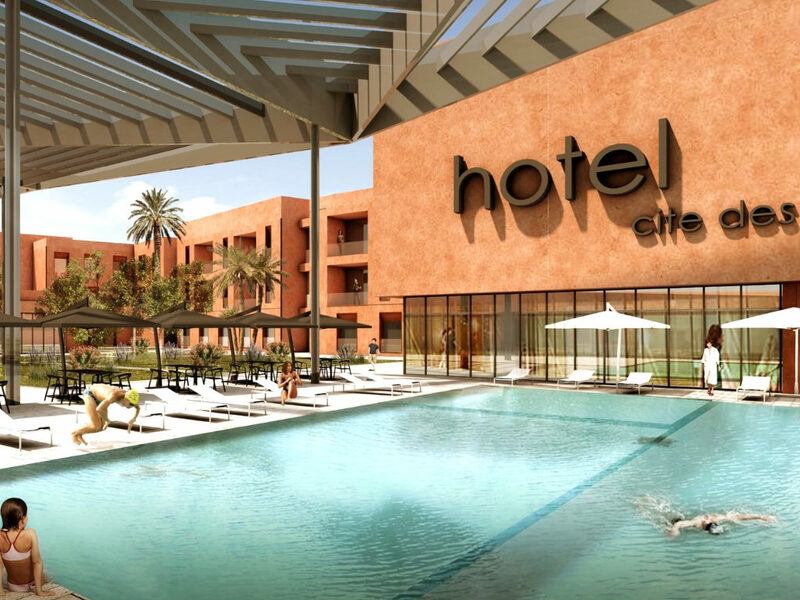 We envisioned a place that was contemporary and global, yet clearly influenced by local cultural heritage. Our solution to the master planning challenge was the strategic layout of functions around a large central garden. This layout would encourage encounters and relationships in a welcoming atmosphere. 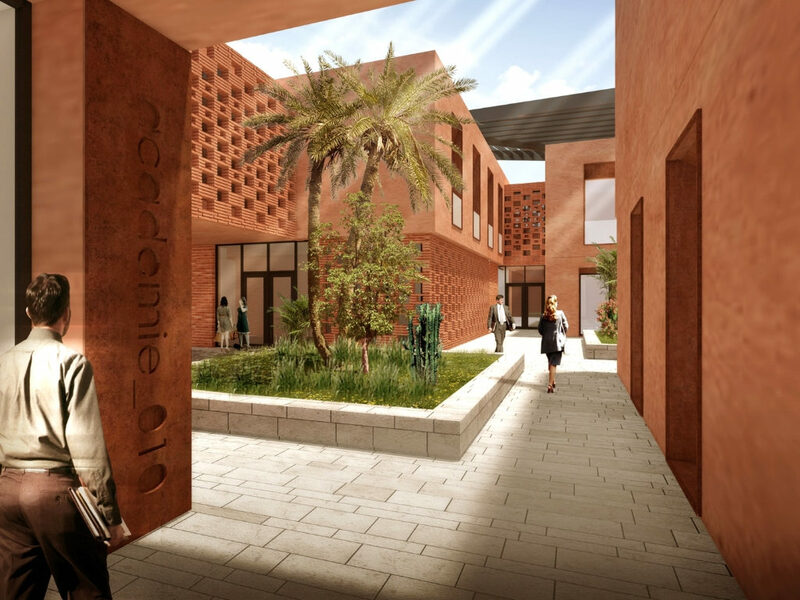 We referenced an urban medina, the old walled cities of North Africa, for the primary program elements. A large adjacent space transcends the scale of a confined city. 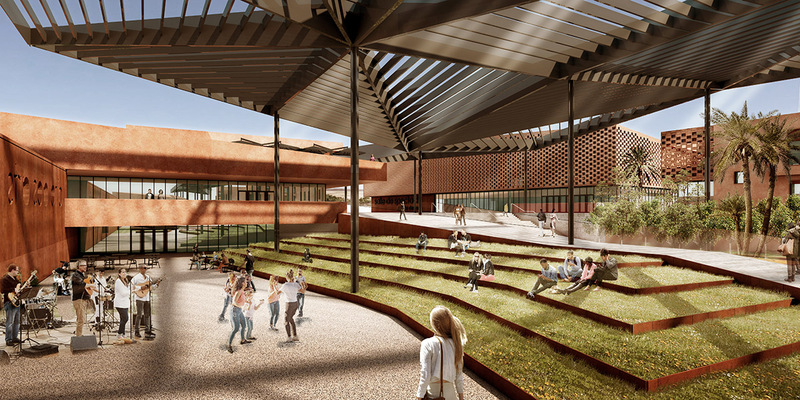 It takes on the role of the central gathering space featuring landscaped areas and performance spaces. Set below the primary building facades, this sunken garden is the connector for the site, linking all the programming components with a variety of stairs and ramps that provide views and vantage points to the site’s multiple complexes. The elevation of the garden provides a respite from the more intense activity above, and provides daylight and fresh air to the underground parking. 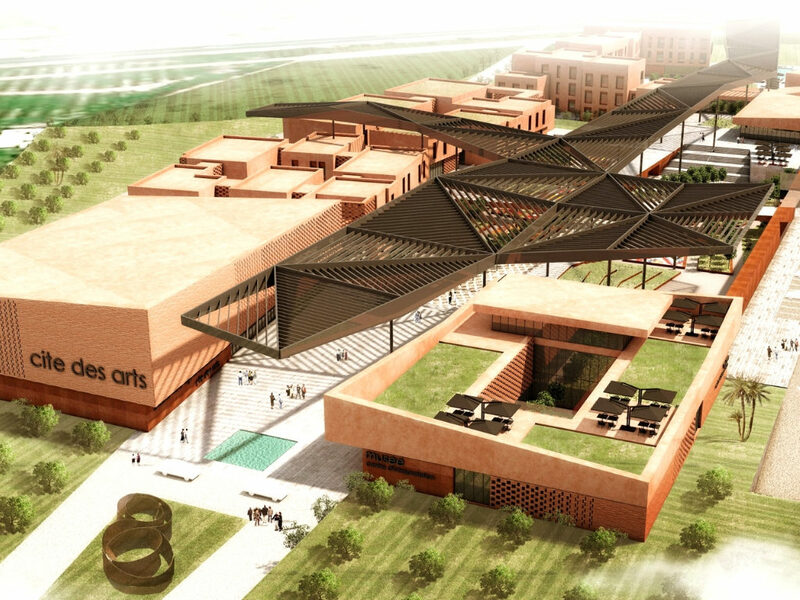 Above the garden, a warm “village” atmosphere completes this cultural complex. Given the variety of programmatic functions and uses, one challenge was to synthesize all the various building types into one harmonious whole. This conversion needed to take into account the specificities of each planned facility. The smaller-scaled plazas and patios create a denser labyrinth of pedestrian areas. 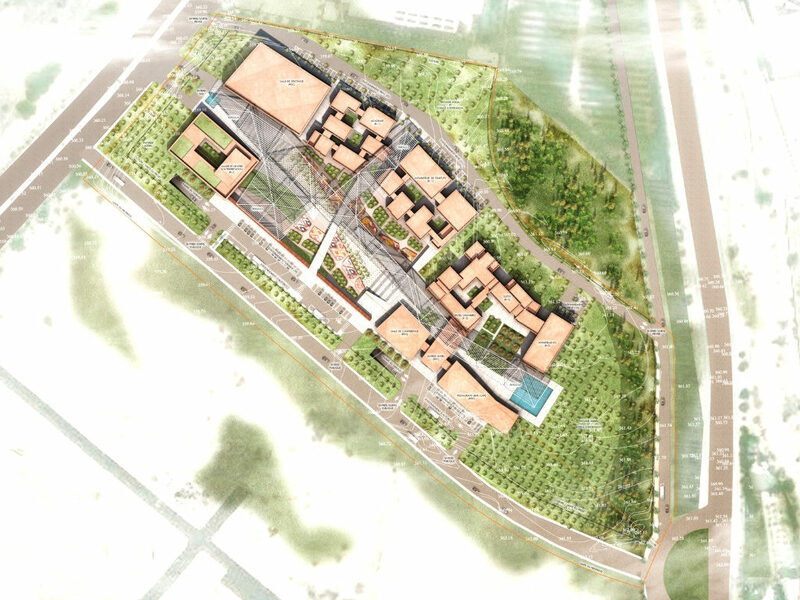 Within each of the separate zones; academy, hotel and conference, and museum, the design promotes connections to the large communal garden where students, museum patrons and hotel visitors mingle. A359’s architectural design for the center featured a large trellis serving as an iconic sculptural feature. This trellis shades outdoor spaces and extends the amount of time people can spend comfortably outdoors during hot months. 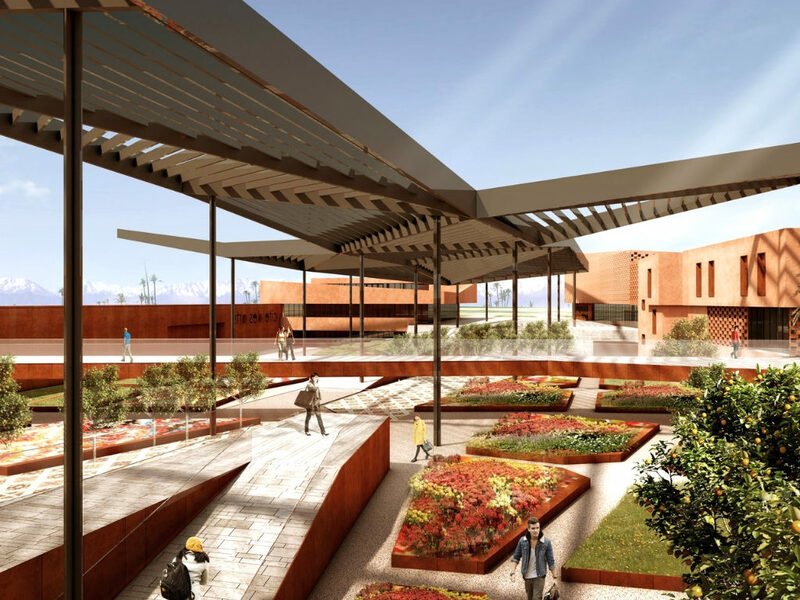 As part of the master planning, the sunken garden features indigenous plantings designed to recall traditional Moroccan weaving patterns. Water features, trees and ground-plane textures add variety to the space and create defined zones for musical and theatrical performances. The large amphitheater includes seating on wide grassy terraces. These visually connect to the museum’s indoor art collection. Large outdoor murals and sculpture reinforce the center’s role in art promotion. Glass panels enclose ramps and elevated walkways. This transparency allows for unimpeded views across the campus. Our multinational interdisciplinary team worked intensely on the project, leveraging each other’s expertise. 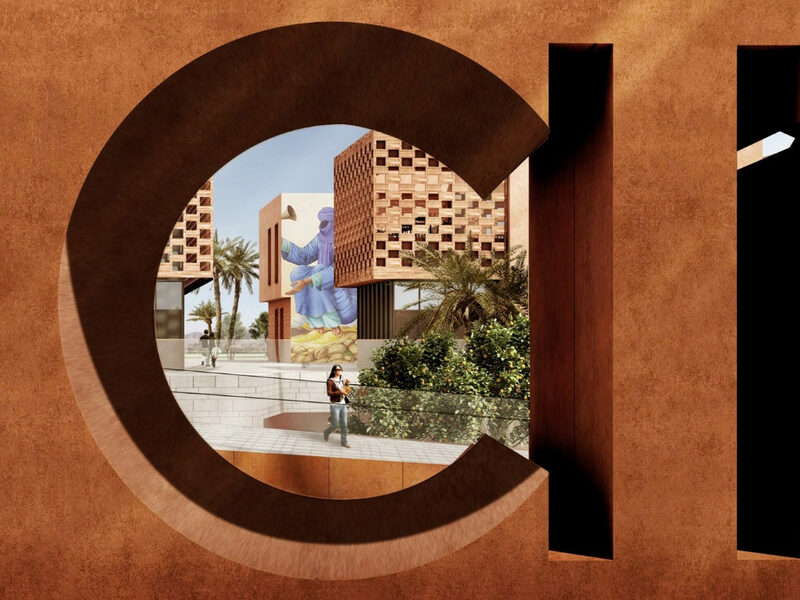 A359 collaborated with Moroccan architect Zouhair Chanoui and French landscape designer Matthieu Maniaci on this international competition entry. 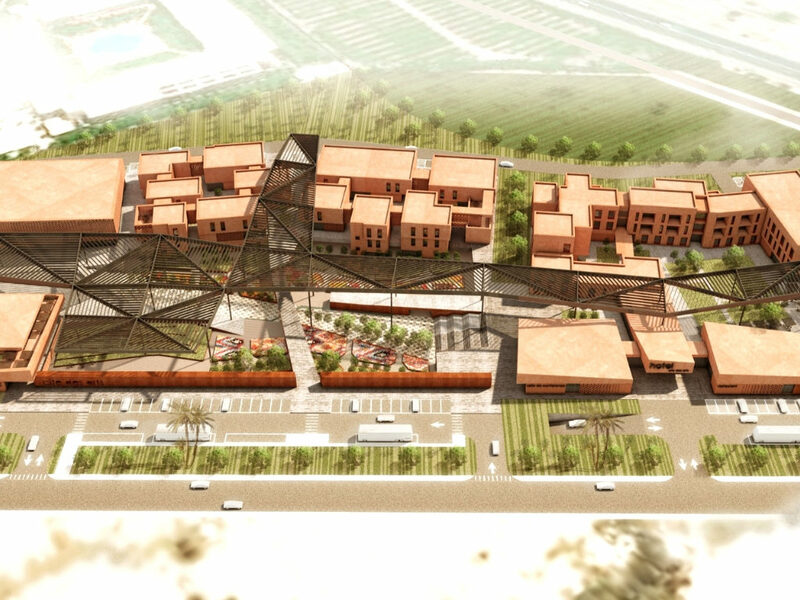 Our collaborative design was awarded second place by the Moroccan Ministry of Interior.